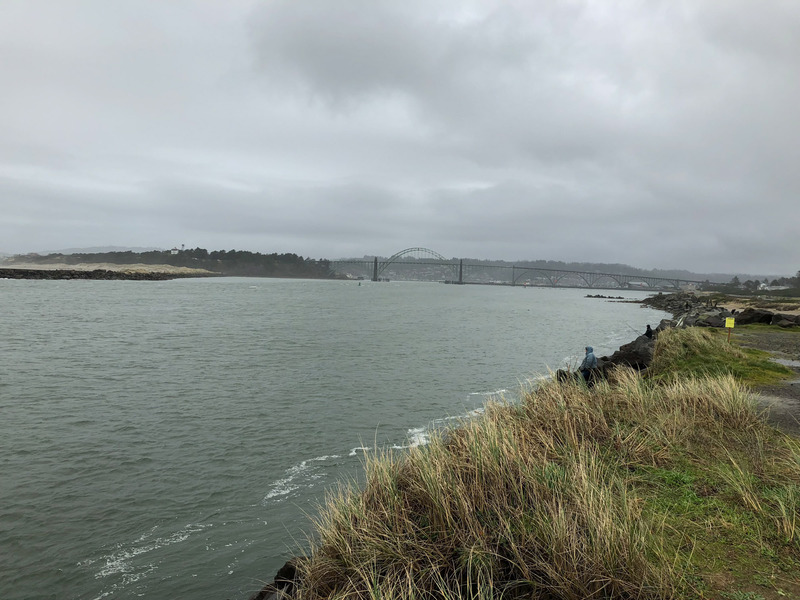 Last weekend the forecast predicted heavy rain and winds on the coast. I believe it read “rain and dangerously windy.” Sounds like perfect birding weather to me. With only the weekends to bird, sometimes I have to take what I can get and this weekend I took it. 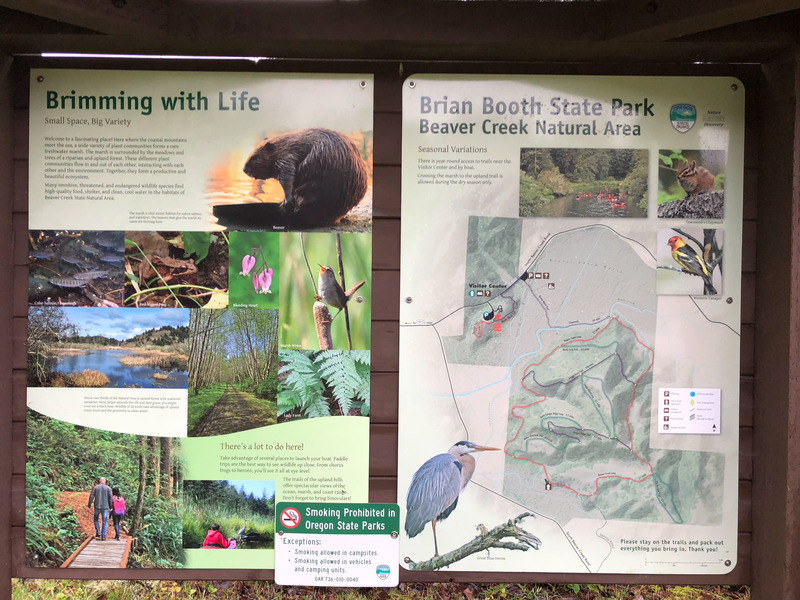 It seemed milder than predicted when I arrived at Brian Booth State Park (also known as Beaver Creek Natural Area), located just minutes south of Newport, OR. 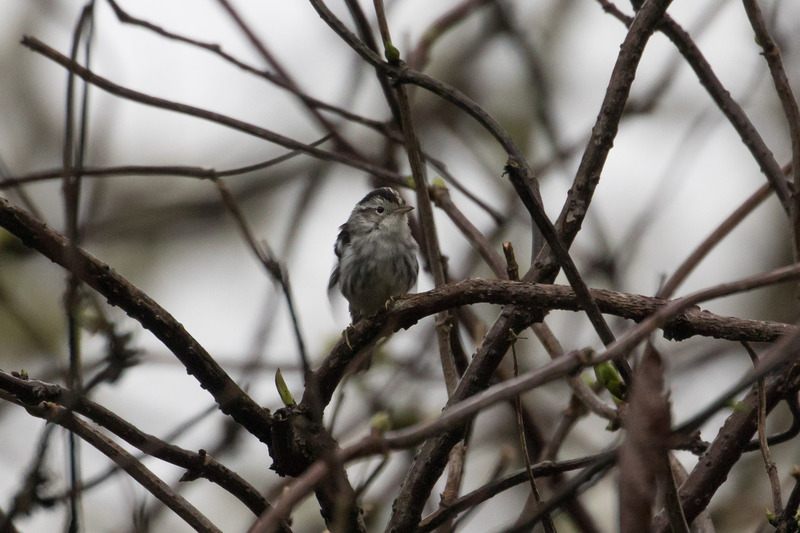 I was hoping for a tiny Black-and-white Warbler that had been reported at this site in the weeks prior. As usual I arrived in the pre-dawn hours and began scanning the trees. 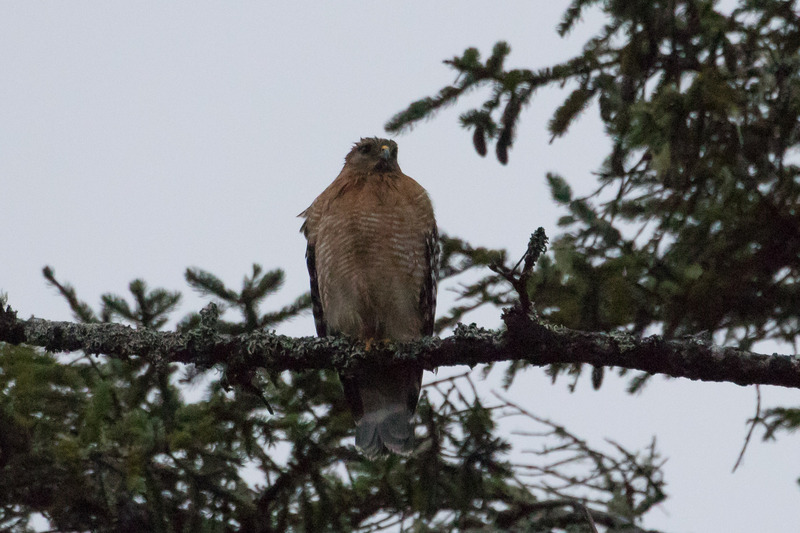 I welcomed the sight of a Red-shouldered Hawk in the darkness. I spotted a Red-tailed Hawk picking on nutria road-kill, and heard Bald Eagles calling in the distance. Along the road edges Fox Sparrows scratched in the leaves. I wasn’t sure I was at the right tree patch, but I kept my eyes on the alders hoping. 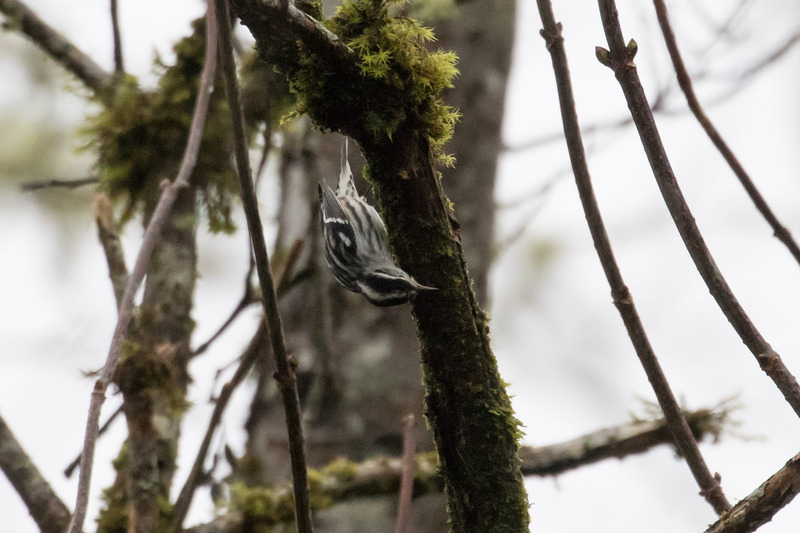 For a while there was little bird action until all of a sudden dozens of small birds flew in; Pine Siskin, Chestnut-backed Chickadees, Brown Creeper, Golden-crowned and Ruby-crowned Kinglets, it was overwhelming, but eventually I picked out the tiny warbler I’ve only seen before in Florida. It acts quite like a nuthatch, inching along branches gleaning insects from the moss and bark, often turning upside down. I watched and enjoyed for a long while. And then it sat on some branches and preened itself. Such a good little warbler. I’d driven a long way and had set aside two days, but here were great looks at this handsomely streaked bird and it was only 9:30am. What to do next? 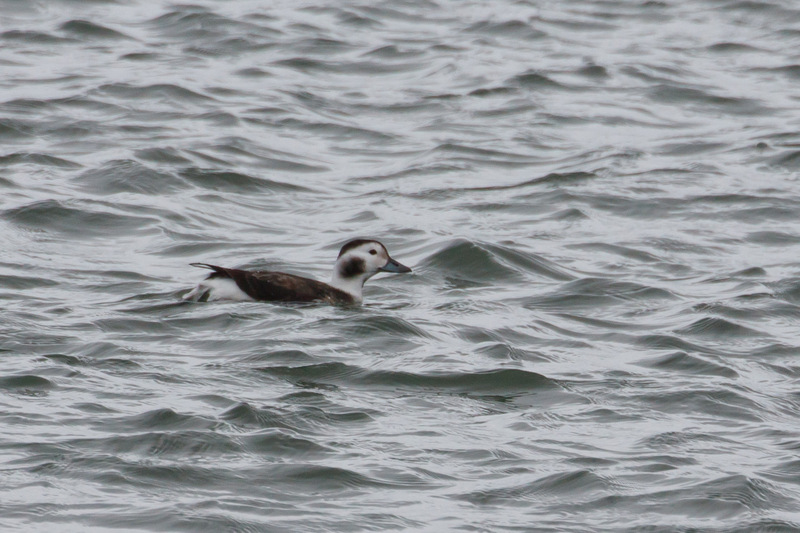 With all this time now on my hands I made a stop at the South Jetty, where I found Red-throated Loon, Red-breasted Merganser, Surf Scoters, and the best surprise was a nice look at a (non-breeding female) Long-tailed Duck. Impossible to misidentify that one. 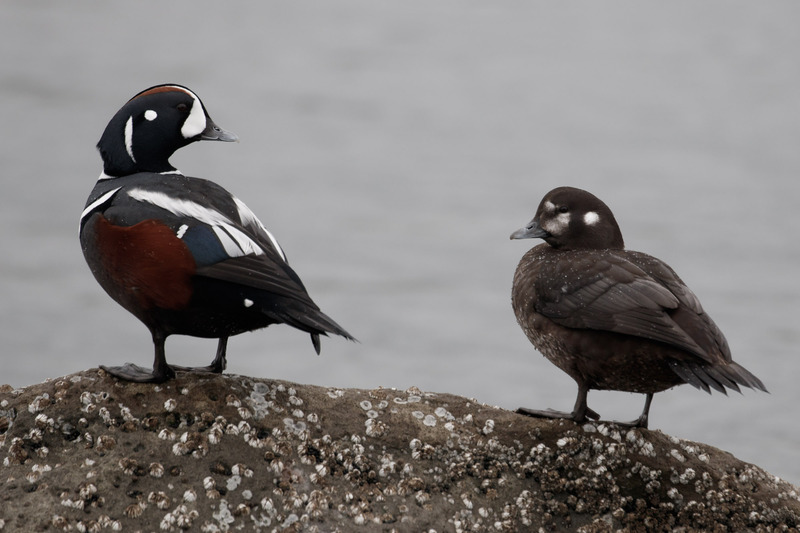 Another unmistakable pair of ducks present on the rocks nearby were this lovely couple of Harlequin Duck. Farther down at the gull puddle I found my first banded gull! 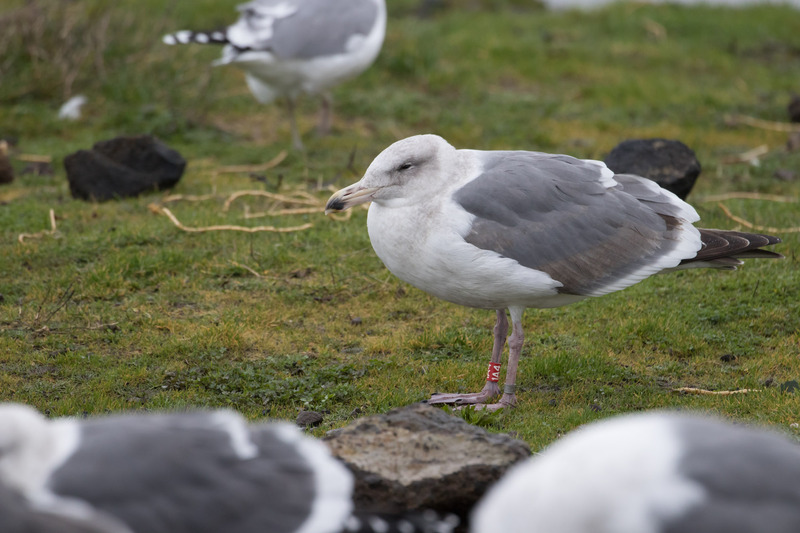 1A4 looks like a squinty-eyed 2nd winter Western Gull; blocky head, large bill, pink legs, dark primaries. I’m still waiting to hear back on the report, stay tuned for the update. 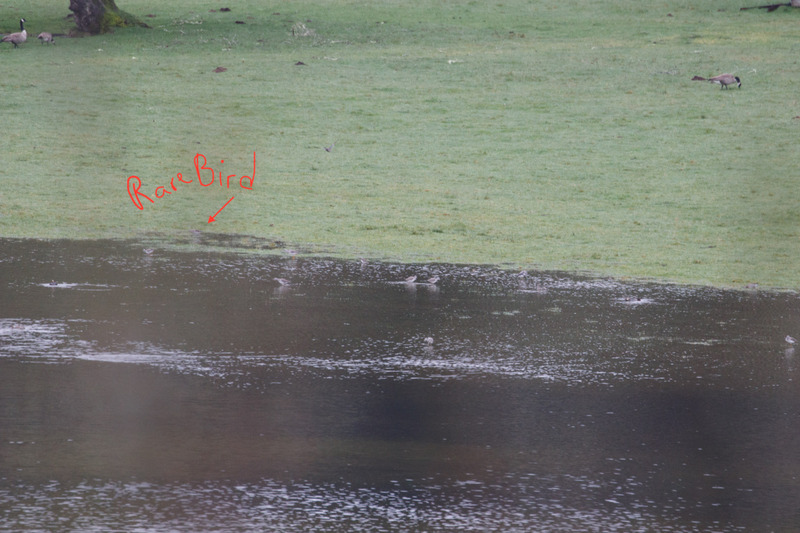 I looked for Lapland Longspurs and Snow Buntings but found neither of these. 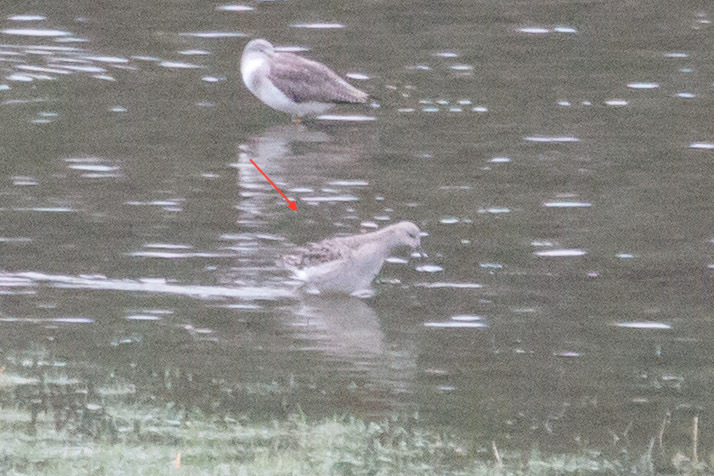 I decided to check for a Ruff, a Eurasian shorebird that sometimes strays to North America, and had been sighted at the coast recently. Now that I had cell coverage again, I learned that the Ruff was down the same road I’d seen the warbler, so back I went. 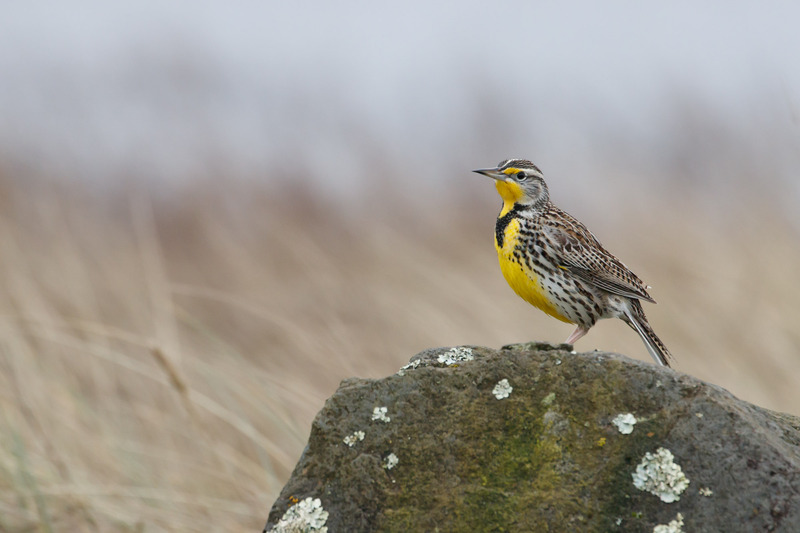 As I left the jetty a flock of Western Meadowlark flew in. 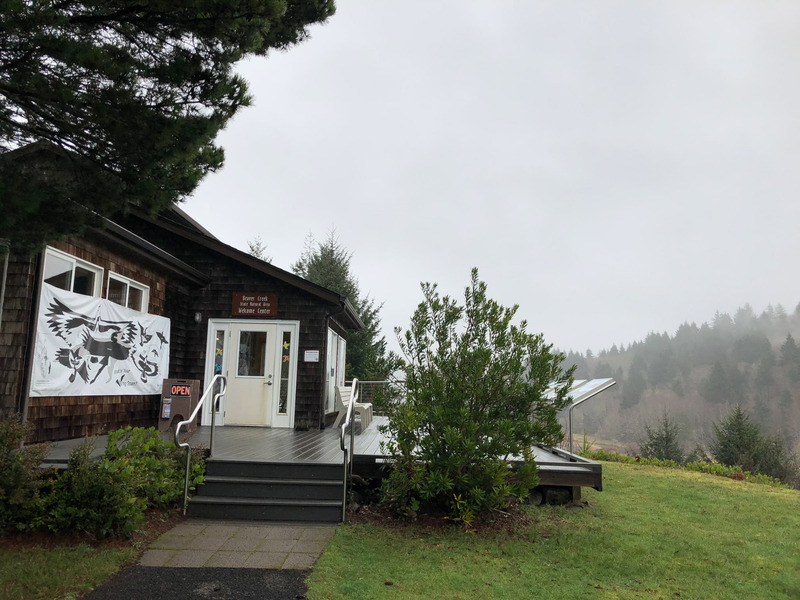 Back on Beaver Creek Rd I drove farther along than before and bumped into a little-advertised Beaver Creek Nature Center. 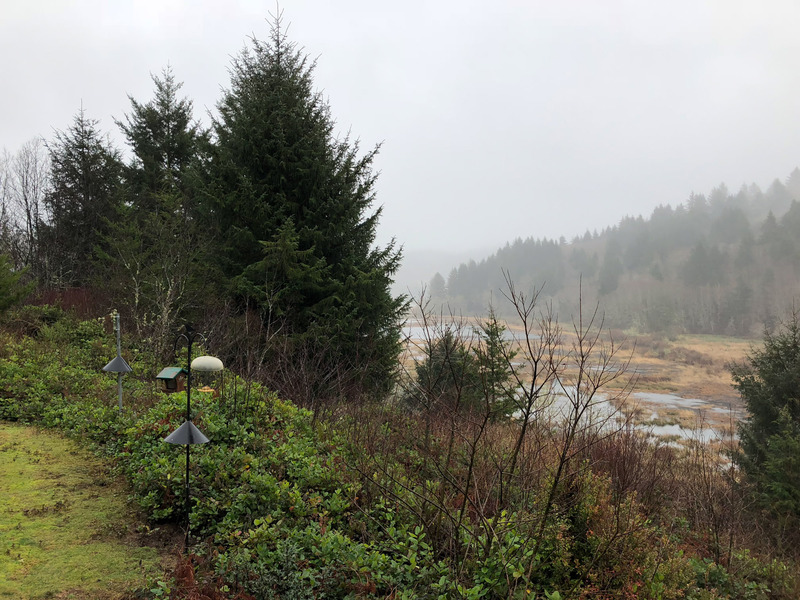 The place had information, hiking trails, and even bird feeders. 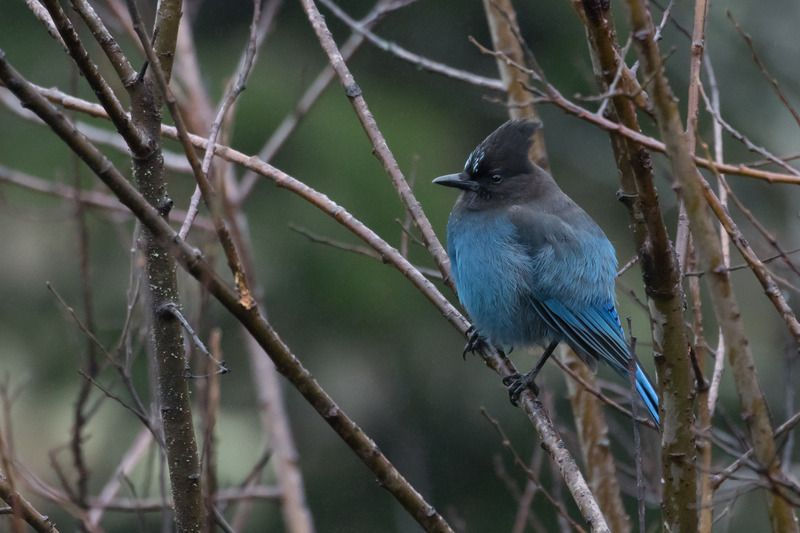 At the feeders were chickadees, towhees, sparrows, and Steller’s Jays on guard. I took a short and peaceful hike, no other people to be seen. No birds on the trails either, but it was still really nice. Then farther along the road I heard two Virgina Rails “oinking” at each other in the marshland. No visuals of course, but here’s a visual of their call. Another mile down the road still not finding any shorebirds, I then heard the loud rapid “tew-tew” of Greater Yellowlegs and I knew I was getting closer. Eventually I found the tiny blurry dots in the distance. I could barely see so I took a bunch of photos. 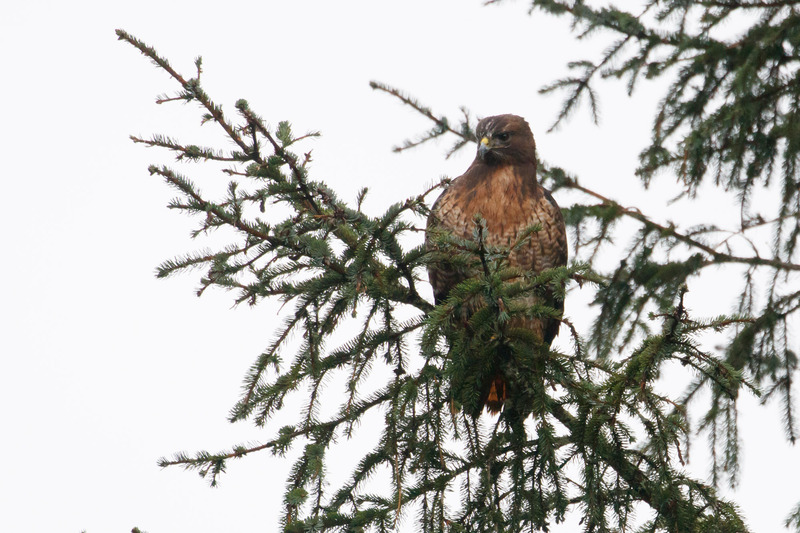 Light was fading and it was hard to focus on the shorebirds with this gorgeous Red-tailed Hawk in my face. The hawk screamed over and over and I knew it was my cue to leave. 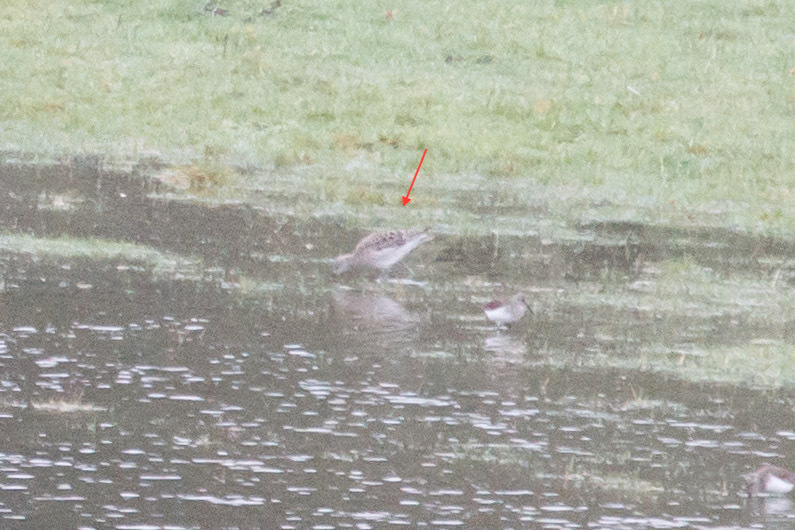 On the way home I wondered if I might find a spec of Ruff in a photo. Low and behold, I found it. Small head, porky body, and scaly-patterned back. Not a glamorous sighting at all, but better than nothing. I made it home by 7:30pm. It had been a long way to go for a day trip, but totally worth it. And now I had an extra day to bird locally. Bonus! 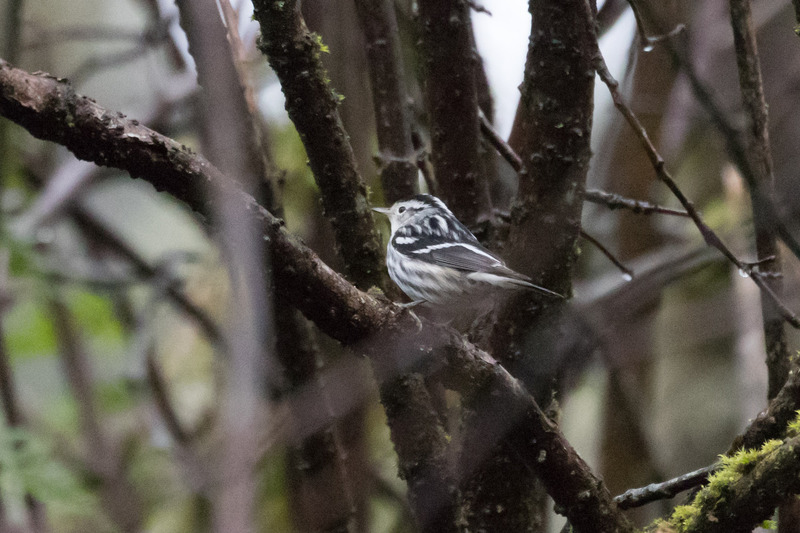 This trip makes me think of all the birds I’ve seen both in Florida and Oregon, Laughing Gull, Palm Warbler, and now Black-and-white Warbler, to name a few. I may list them all up some time. 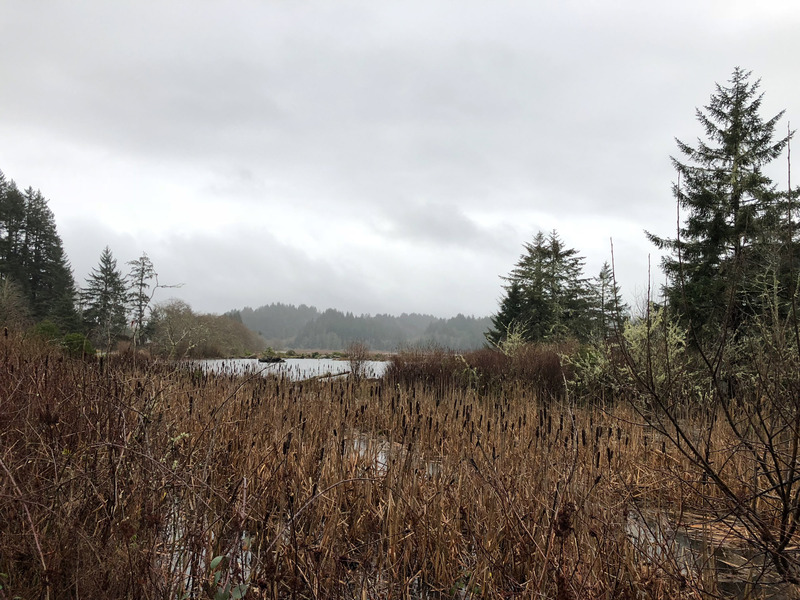 This entry was posted in Birding Trips and tagged Bald Eagle, Black-and-white Warbler, Brown Creeper, Chestnut-backed Chickadee, Fox Sparrow, Golden-crowned Kinglet, Greater Yellowlegs, Harlequin Duck, Long-tailed Duck, Pine Siskin, Red-breasted Merganser, Red-shouldered Hawk, Red-tailed Hawk, Red-throated Loon, Ruby Kinglet, Ruff, Steller's Jay, Surf Scoter, Virgina Rail, Western Gull, Western Meadowlark by audge29. Bookmark the permalink.